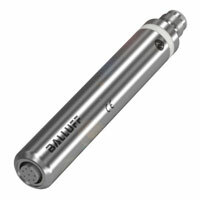 Balluff: A simple and practical solution for connecting RS232 directly to IO-Link is offered by Balluff with likely the first IO-Link converter for RS232 devices. The converter lets you connect devices like barcode scanners, printers or RS232 controllers directly to an IO-Link terminal. The expensive alternative using additional special components such as RS232 cards for integration into the respective controller is now superfluous. The path is finally cleared for the user to switch to IO-Link and enjoy all the advantages of this modern communication standard. For example he can reliably monitor all the devices and quickly configure them from one central location. With dimensions of 118 x 18 mm and a weight of just 100 grams, the IO-Link converter features a rugged IP67, stainless steel housing and digital inputs (2 x PNP, type 3). Highly visible LEDs make diagnostics easier. Connection to IO-Link is made via a 4-pin M12 plug. On the RS232 side an 8-pin M12 female is provided. This also provides 24V power for the RS232 device.